Many families affected by the government shutdown are using the resources available from Feeding South Dakota. Due to the growing need for donations at Feeding South Dakota, donations are needed. Any cereal donations will be accepted and greatly appreciated. 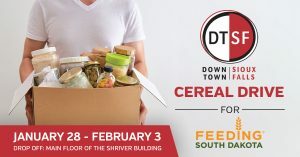 Donations can be dropped off from January 28 – February 3 at Shriver Square Building, First Floor.